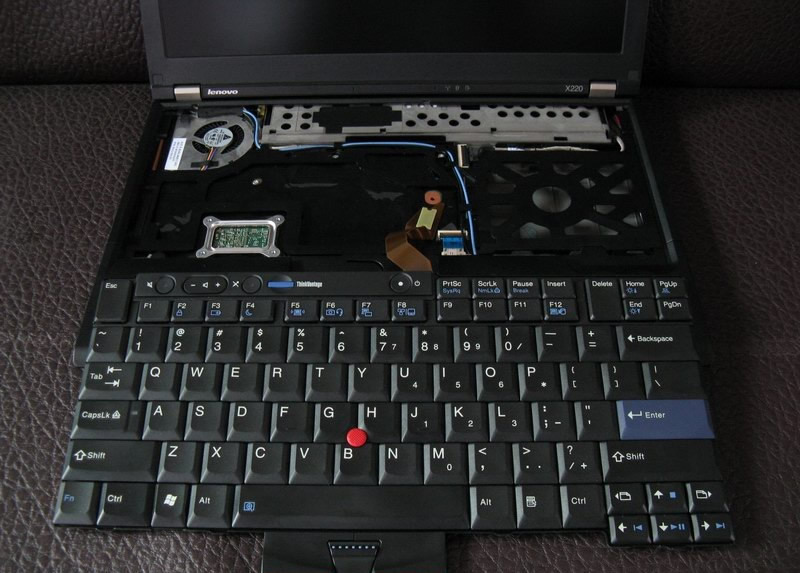 Remove the screws in the red circle at the bottom of the X220. Then you can remove the keyboard. 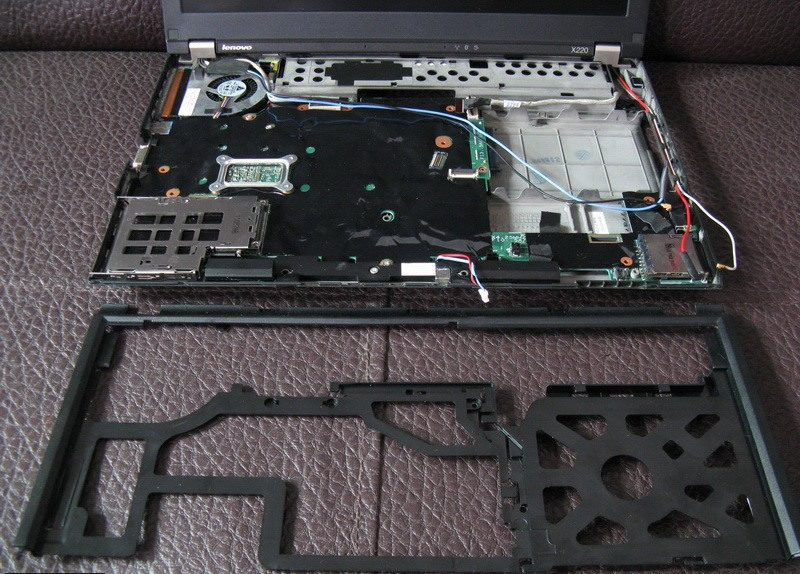 The X220 C surface after removing the keyboard, it seems very simple. Then loosen the data cable connecting the palm rest and the motherboard. 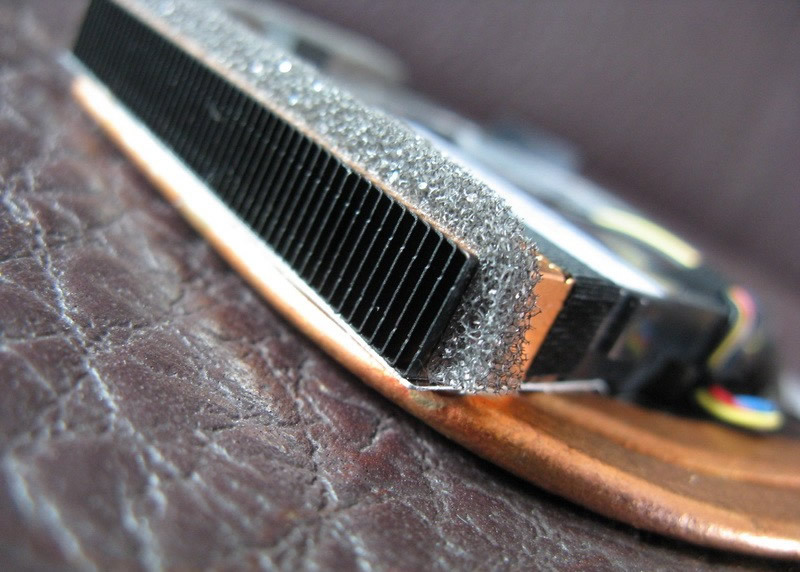 Remove five screws that securing the palm rest, press both sides of the palm rest toward the inner surface to loosen buckle that connects the palm rest to the D shell, and then you can get the palm rest up toward, and then gently push it towards you, you can remove the palm rest. 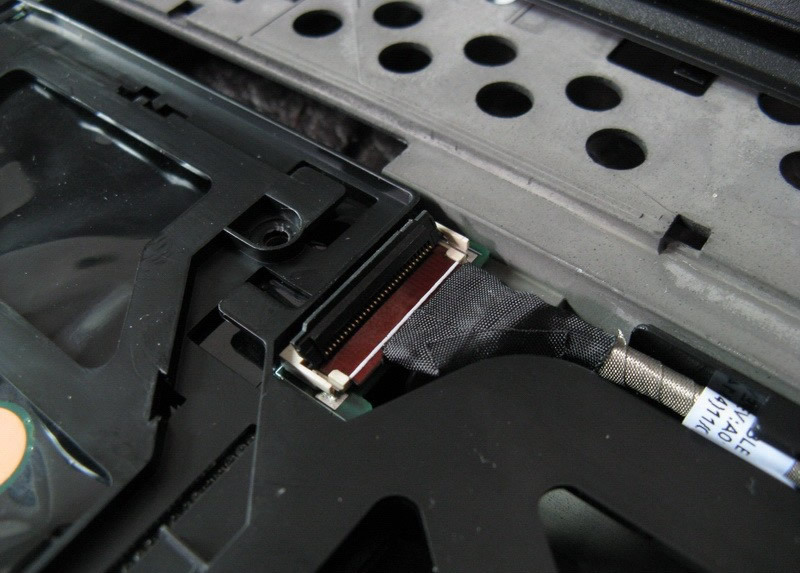 After removing the palm rest, the lower left corner of the C face is as shown below: just a 54 ExpressCard slot, which doesn’t need now, and also cannot be removed. 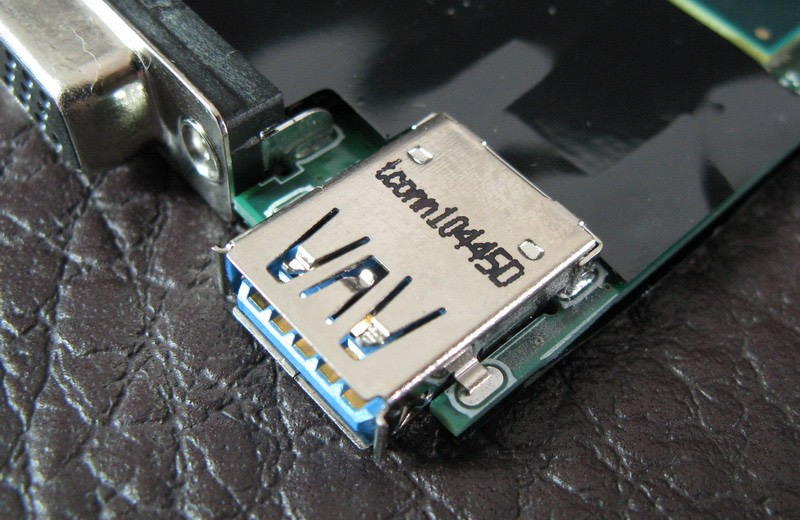 The part connected by the black and gray antenna is a mini PCI-E wireless half-height card. Red and blue antenna convergence is a non-occupation miniPCIE full-height card slot. 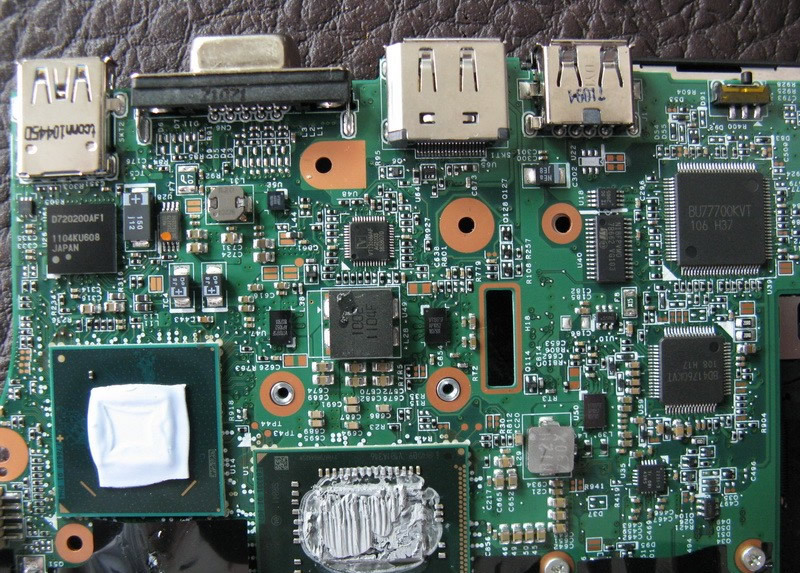 The round part is the motherboard back-up battery (BIOS/COMS battery). 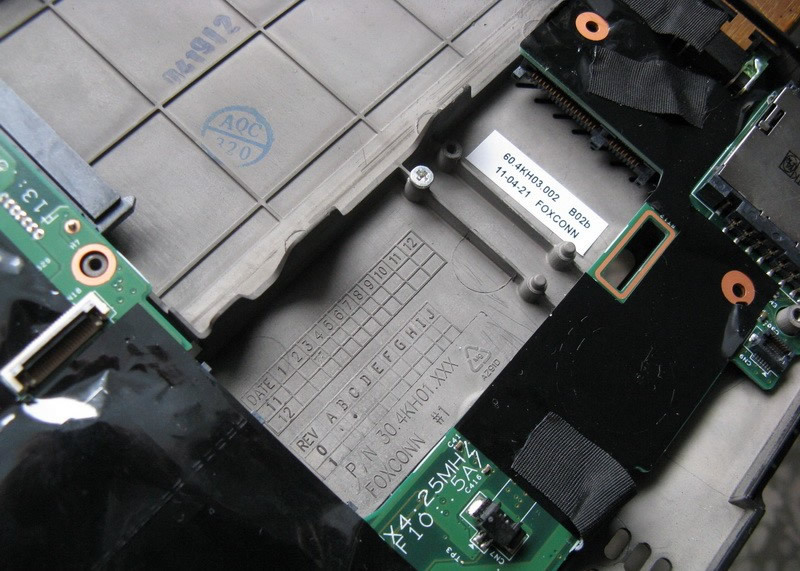 The long object below the motherboard back-up battery is a Bluetooth card. Unplug the plug that connects the backup battery to the motherboard, and remove the motherboard backup battery. 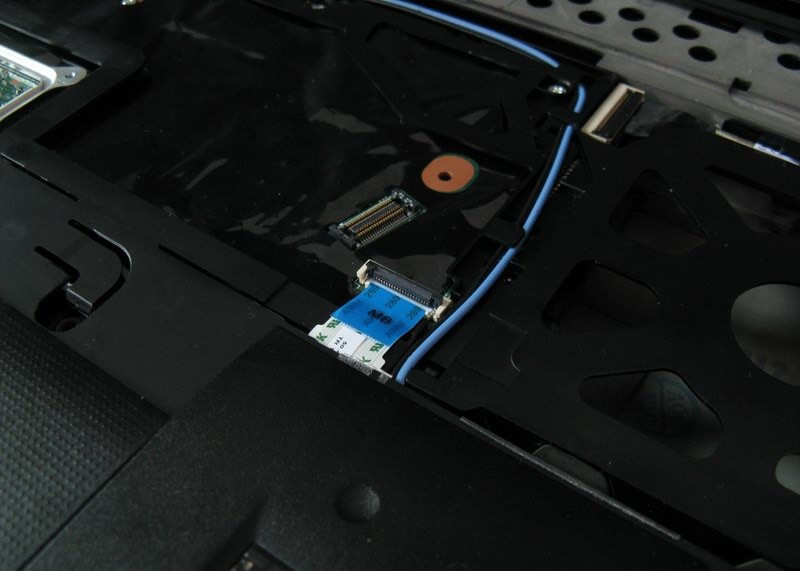 Remove the antenna on the wireless card, and loosen a screw you can pull out the wireless card. 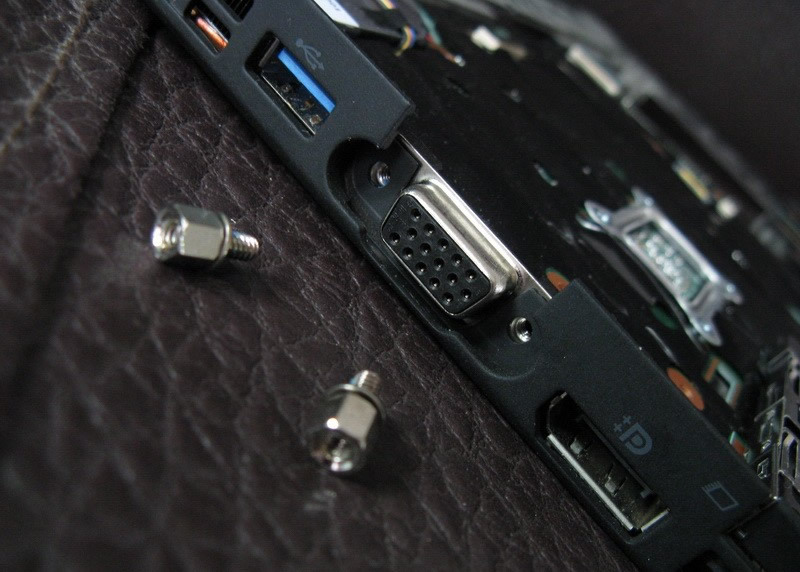 The Bluetooth card can also be pulled out just by loosening one screw. Remove the keyboard dock (commonly known as the C shell). First, unscrew the screws at the bottom (marked below). Then remove the antenna embedded in the keyboard base, and the two screws marked below. 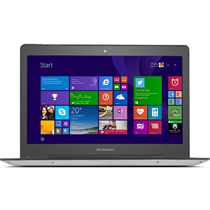 Then remove the screen on the right and the motherboard cable. Finally, press both sides of the keyboard base toward the inner surface to loosen the snap joint, you can get out the keyboard dock. Remove the top cover part from the D-shell base. 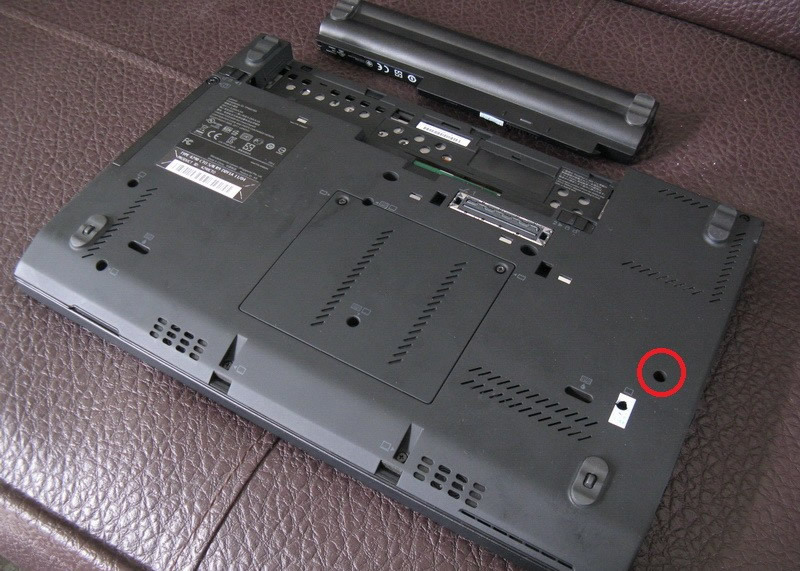 Note first remove the following marked X220 bottom and the four screws in the rear. 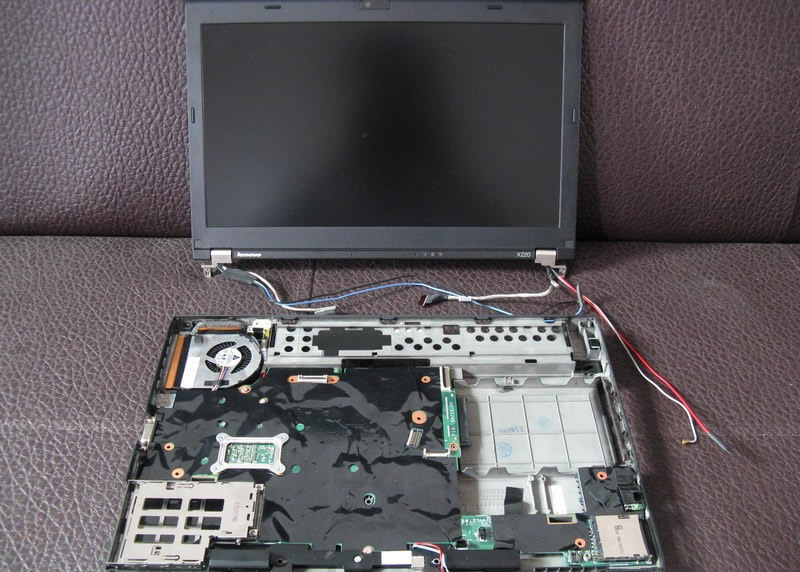 Then remove the cable that connects the screen to connect the motherboard on the left. You can easily remove the entire top cover screen part (note the red gray two antennas on the right, you need to take them out from the D-shell before removing the top cover). 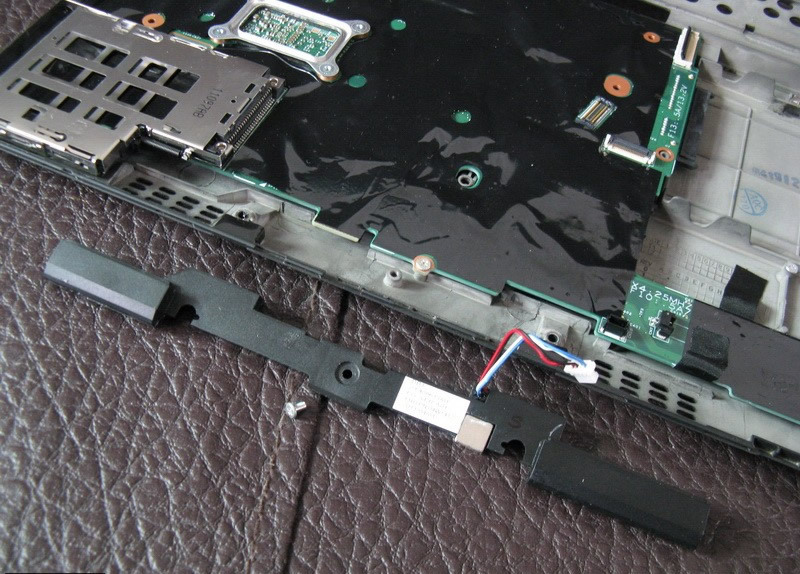 Then remove the X220 stereo speaker system, this is very simple, unplug the cable that connects the speakers to the motherboard, and then loosen one screw. At this point, you can begin to separate the motherboard and D-shell. 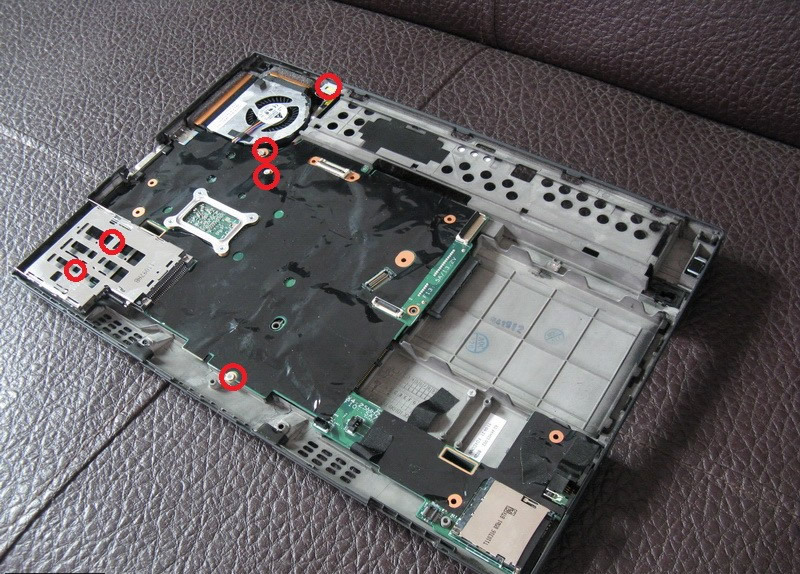 Remove the five screws marked below. The screw at the top is to secure the external power socket. The two at the left are inside the ExpressCard slot. 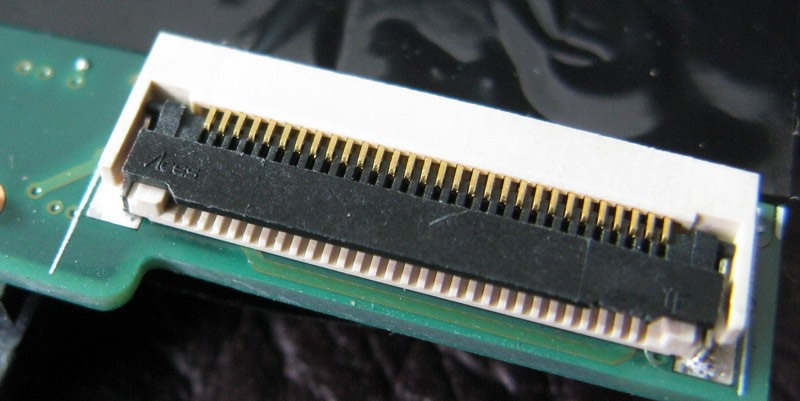 The remaining three screws directly secure the motherboard on the D-shell. They are easy to be removed. Then is to dismantle the two screws near the VGA. 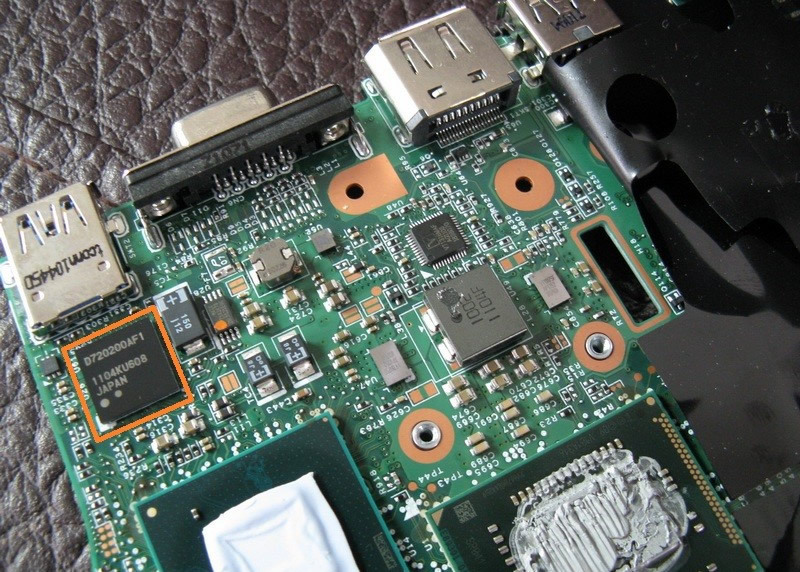 Finally, according to the official description, place the wireless hardware switch in the open position, and then slightly curve upward the right motherboard (the side with a wired LAN port), to get the right motherboard out from the D-shell. 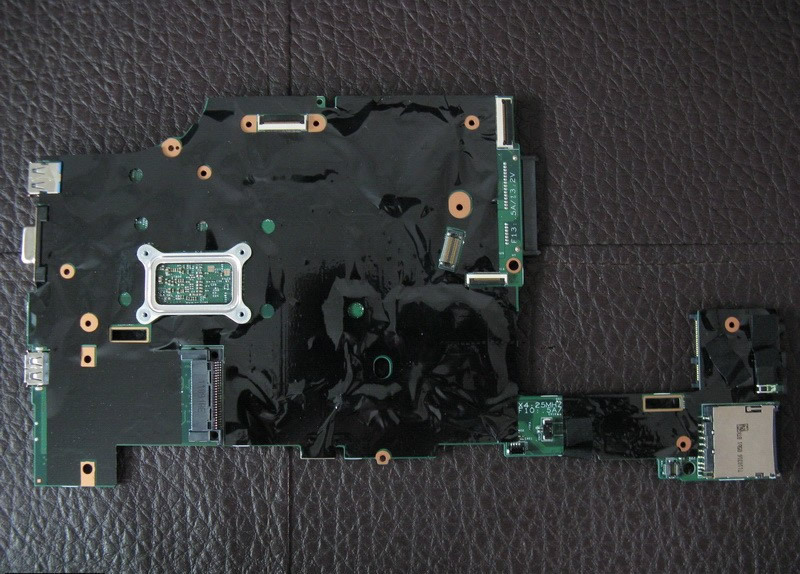 Then you can pull out the entire motherboard towards the right and take it out. 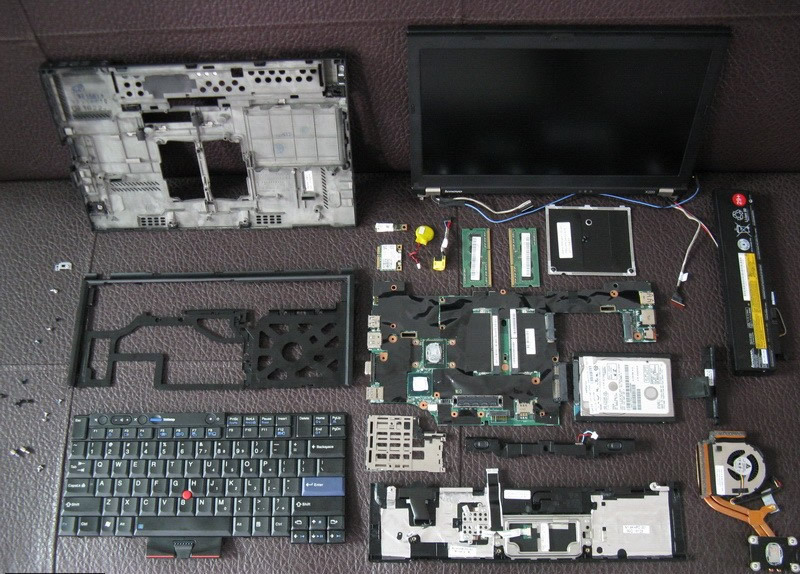 A family photo of X220 removed parts. The red box is the back of the CPU. Yellow boxes are the keyboard yielding water channel. One is at the lower left corner of the CPU. The other is at the top left of the right card reader. 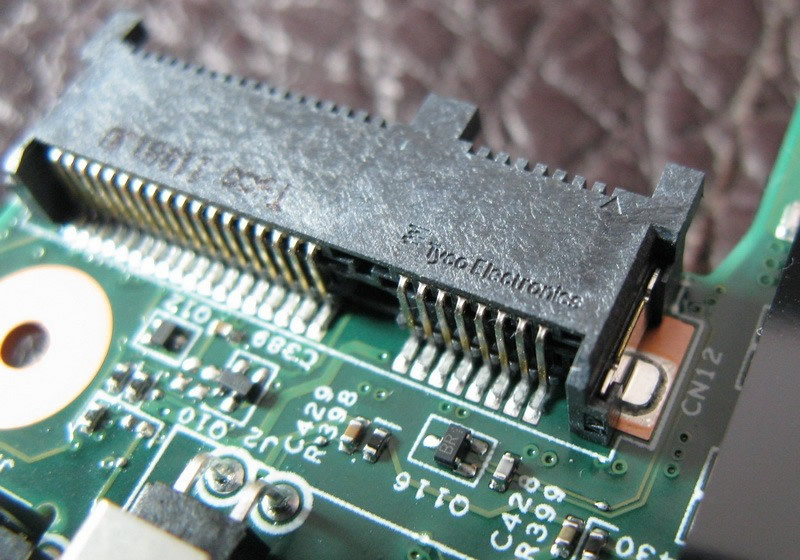 Four blue boxes are cable interfaces, two cables used to connect the screen top cover to the motherboard and palm rest cable and keyboard cable. Four green boxes are respectively the SATA hard disk interface, full height mini PCIe card (WWAN card or mSATA device), half-height mini PCIe card(Wi-Fi card), and the interface used to install the Bluetooth card. Three white boxes are respectively for the 54 ExpressCard port, stereo speakers interface and motherboard backup battery interface. Two red boxes, the above is the front side of the CPU, it’s GBA packaged, so it can’t be replaced directly. The below is the PCH (Platform Controller Hub). Two yellow boxes are two memory slots. 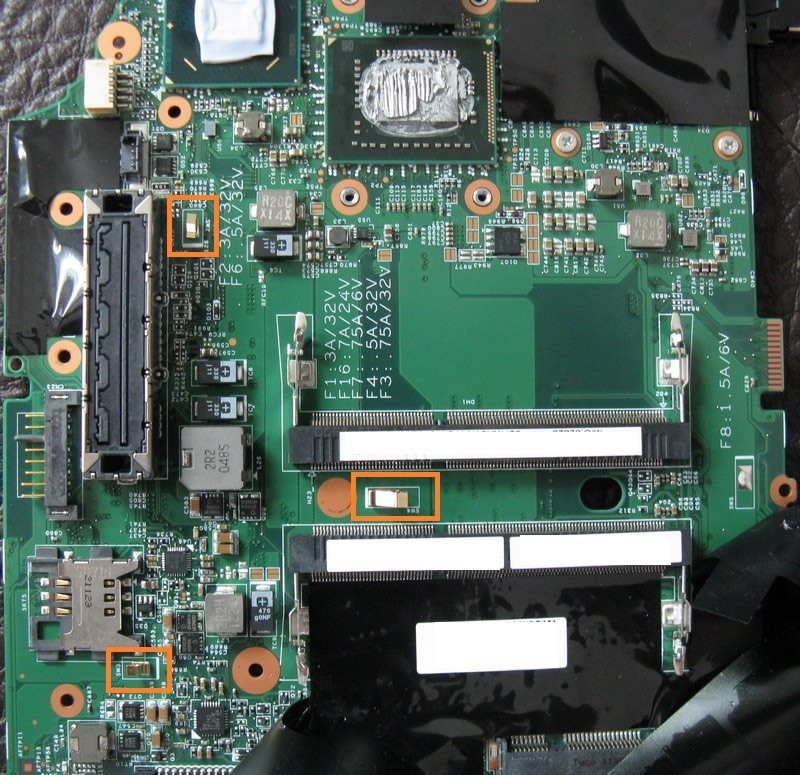 Three green boxes are the motherboard external power DC jack, fan power connector, and the expansion interface (used to connect the dock or docking station) from left to right. 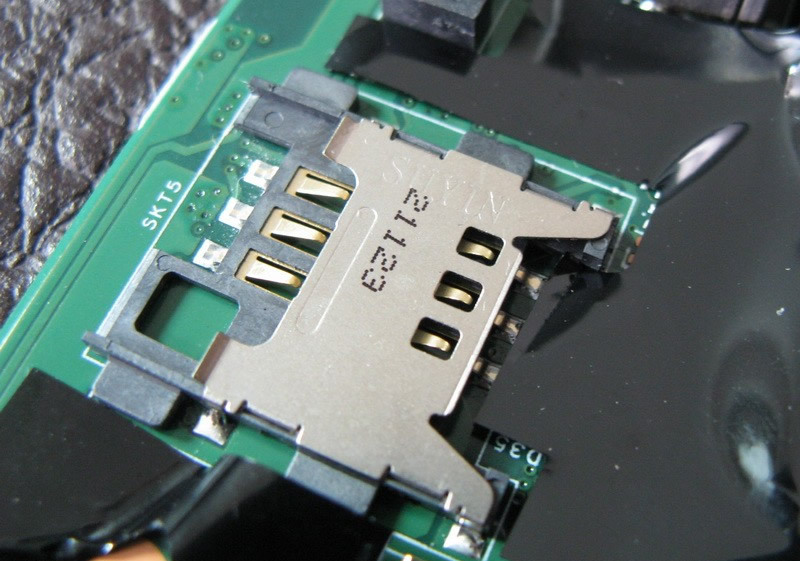 Two blue boxes are battery connection interface and SIM slot. The parts on the back of the CPU still look very seductive. 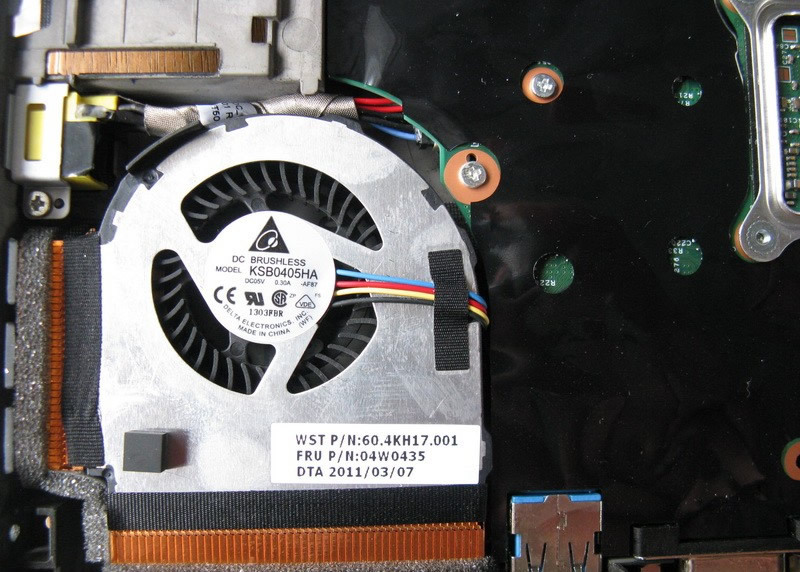 The X220 cooling system fan is from Delta Electronics, the parameters marked above are DC05V 0.30A and 1.5W. 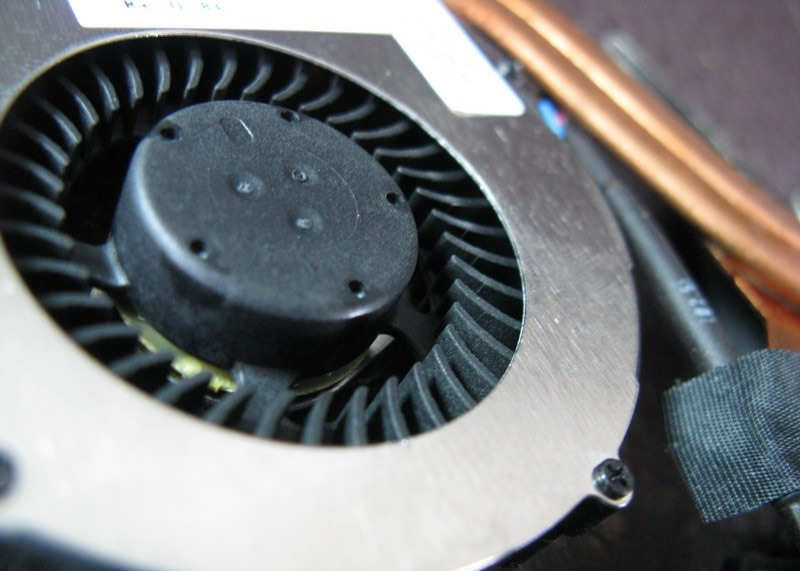 The cooling system consists of the fan and two copper heat pipes, heat conductor copper and fixed connective accessories. 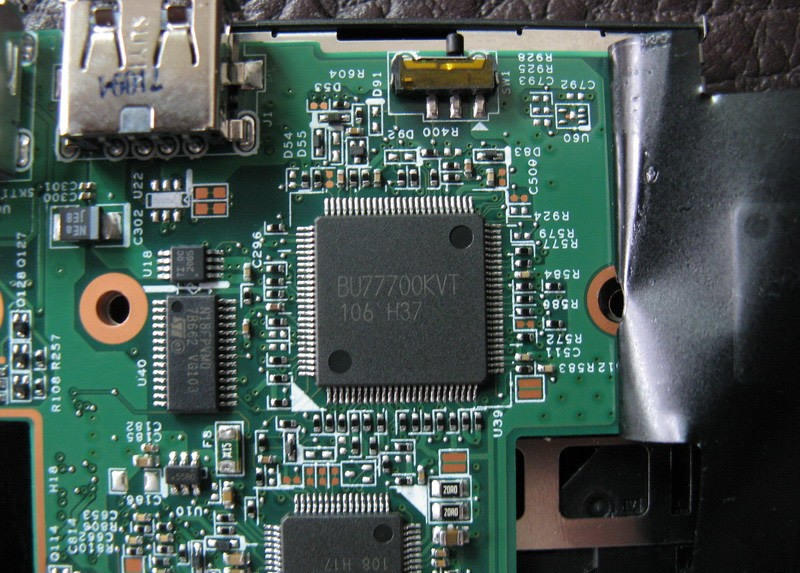 The interface on the X220 motherboard that connects to the LCD cable. 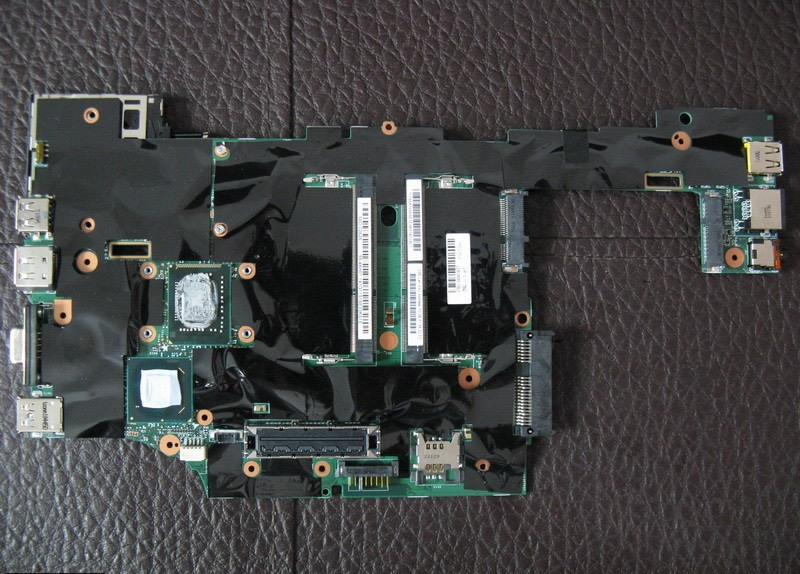 Both sides of the X220 motherboard use black insulation tape. Uncover a corner of the black insulation tape. 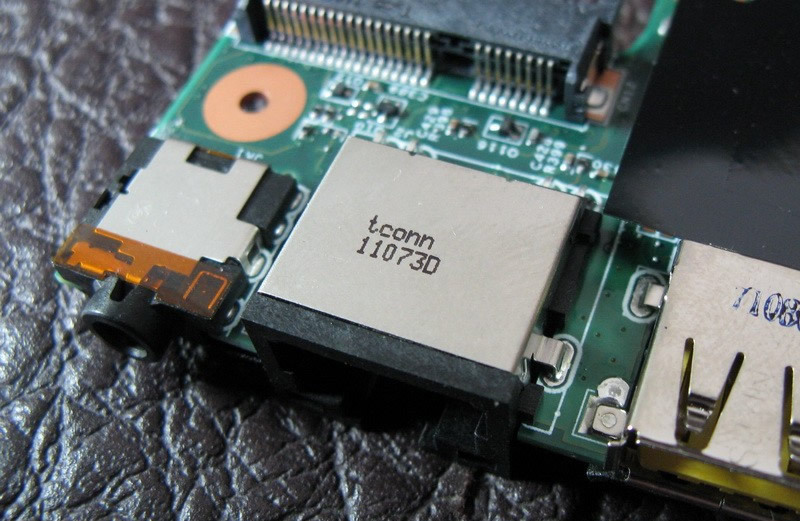 You can see the third-party chipset that USB3.0 uses. 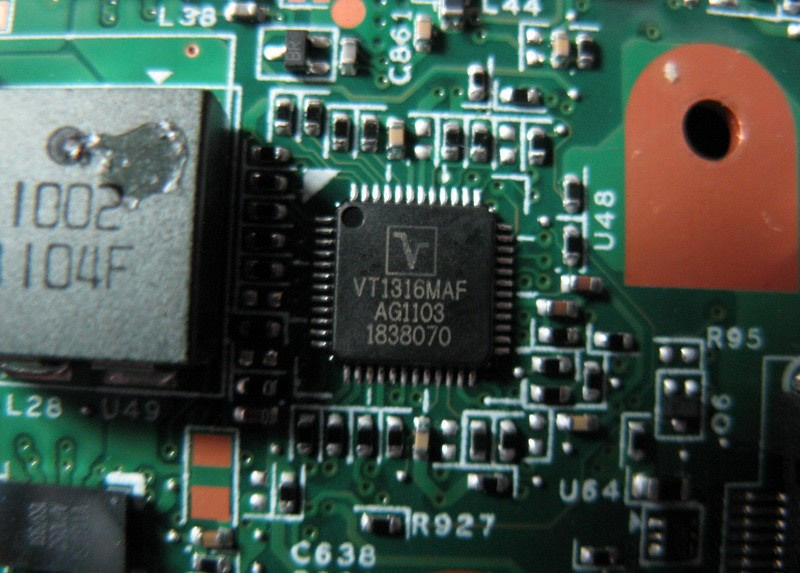 The VT1316MAF produced by Volterra semiconductor has never been seen before. It should be a new model. 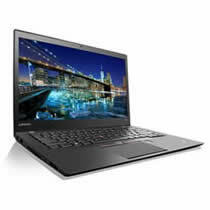 Seen from the number, it should be similar to the VT1317SF, and it should be responsible for the CPU power. Finally uncovered all the insulation stickers around the back of the motherboard. Continue to the uncover the insulation tape around the memory. Three copper contact switches marked with orange boxes are labeled as SW2, SW3, SW4. 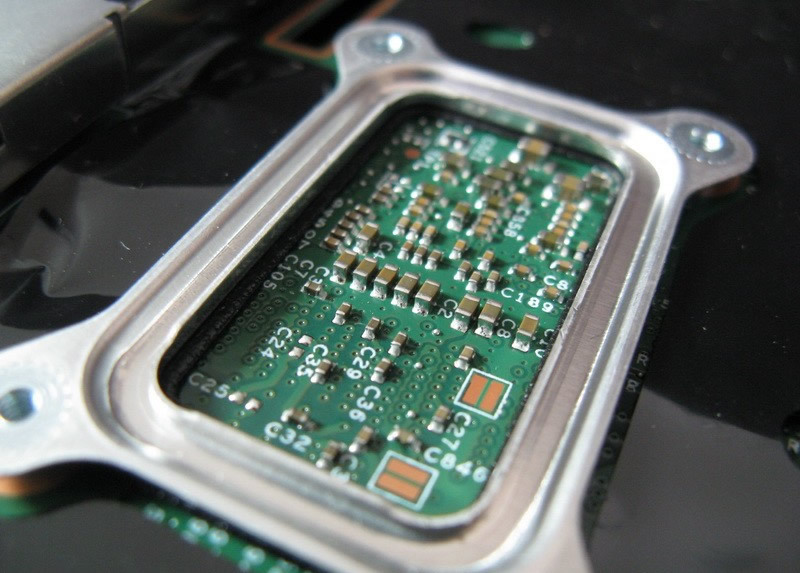 It should be used to determine whether the motherboard in place and a good EMC/EMI function together with the D-shell. The question of the RJ45 Ethernet port location. Careful readers can see the top right corner of the D shell, between the security slot module and the drive bays, there is a quite large empty space, which seems sufficient to place the RJ45 Ethernet port. 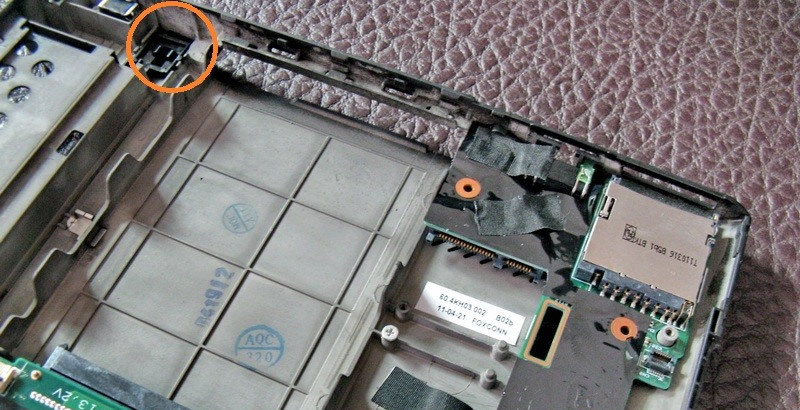 In the orange circle, the black plastic block is a battery locking device in the battery compartment, the height (or thickness) is not great, the space above it is empty, so it seems feasible to place the RJ45 Ethernet port above it. Perhaps there is an alternative: shown in the blue strip below. 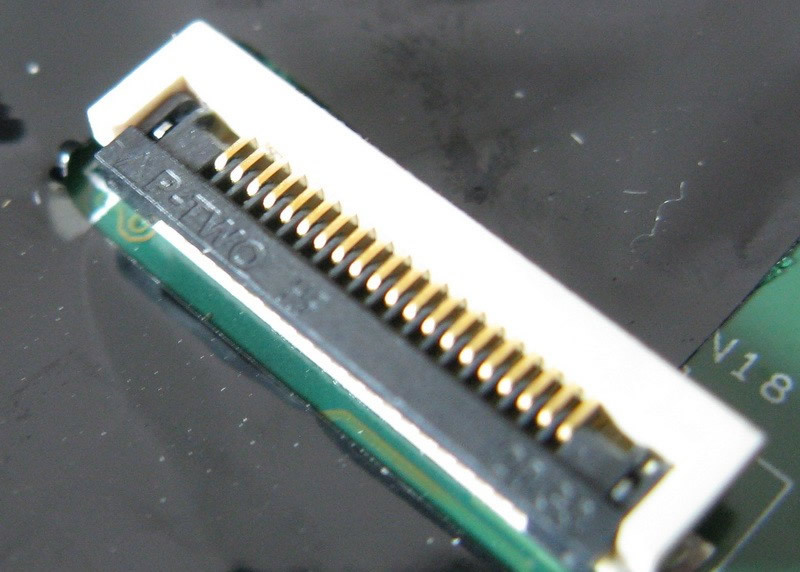 This long strip space is basically idle in X220/X220i, and it’s only used to place the cable that connects the right of the screen to the motherboard. 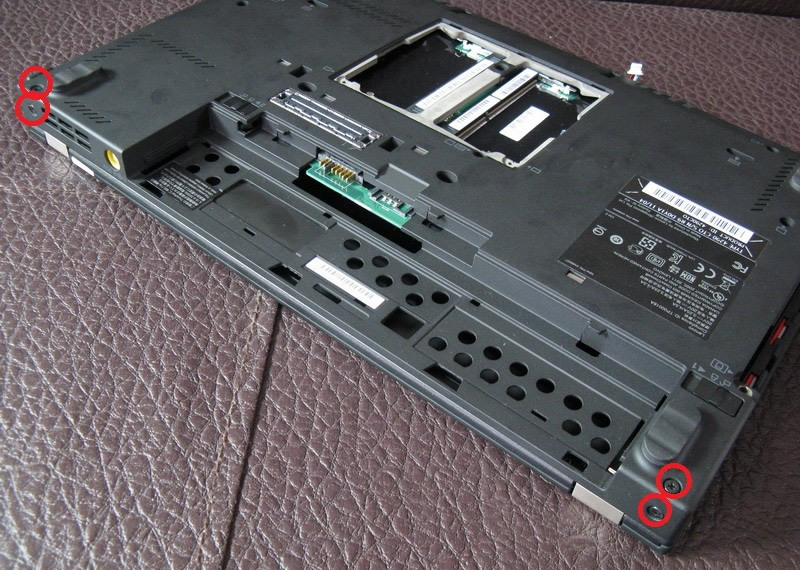 However, this area is used to place the stylus in the X220t or X220it. Therefore, the right part of the case of this region cannot be used to place the RJ45 Ethernet port. In the figure above, the orange box is the battery lock switch. 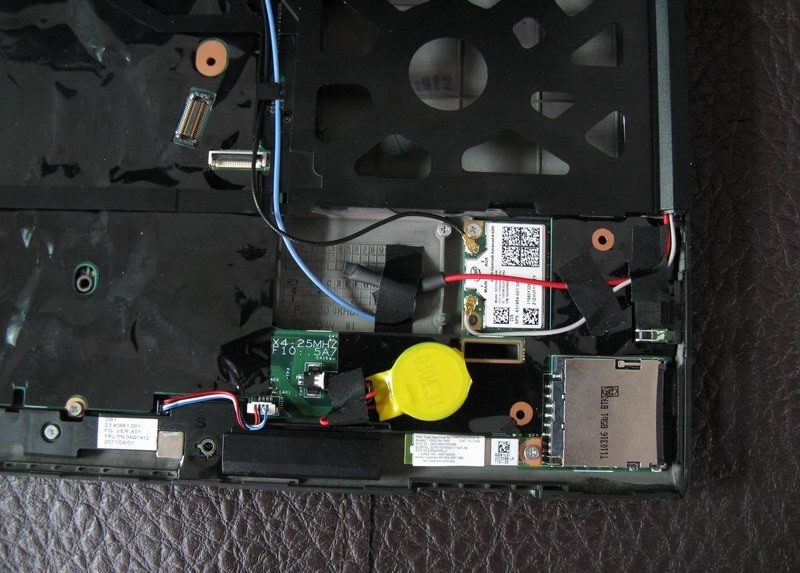 The green area is occupied by the security slot module, and the white box is where the screen hinge lies. 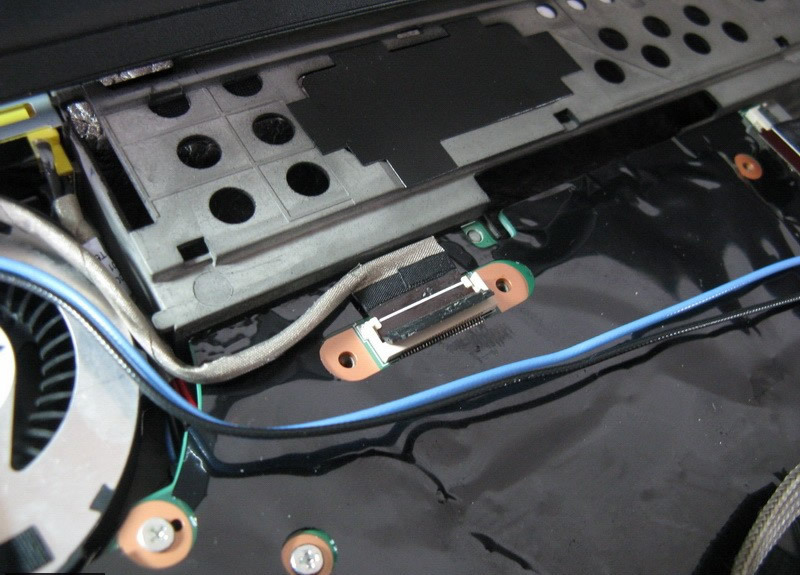 The RJ45 port is placed at the top of the battery lock switch, as shown below. So in order to ensure sufficient lateral space, the safety lock module must be removed to screen hinge direction, the best design is the safety lock devices and screen axis placement as one solution. Thanks for posting this. 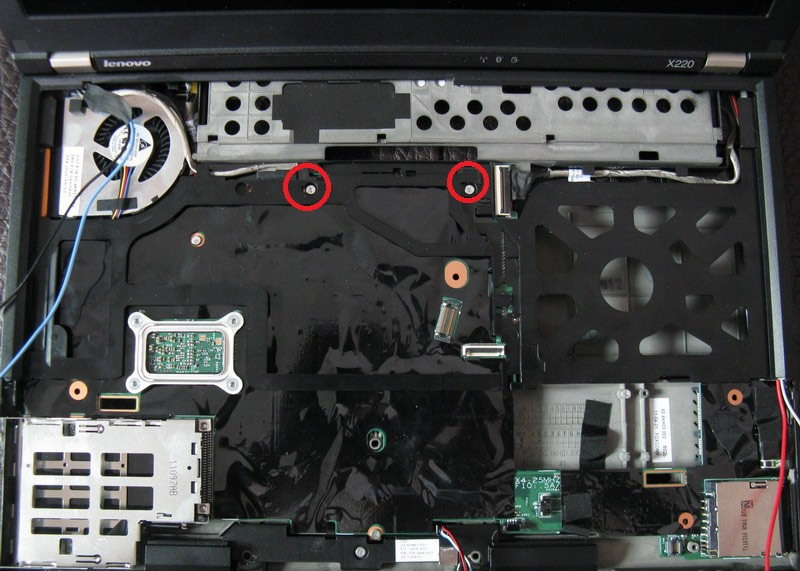 The Lenovo hardware manual doesn’t specify that the screws holding the VGA in place can be removed. I was stuck there until I found your page. Now wish me luck with putting this thing back together! Thank you for sharing your knowledge; helped a lot. 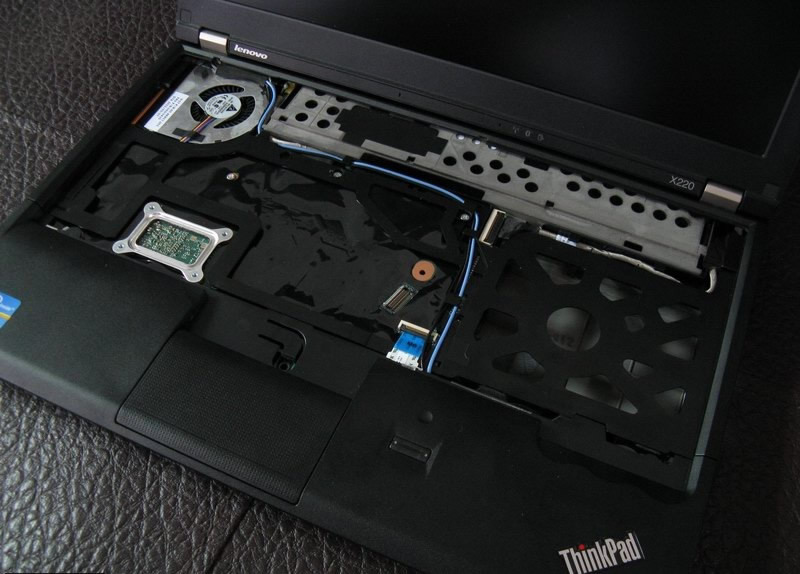 You have to remove 5 screws to finally remove the palmrest… Please add this to your tutorial! We have added this to the guide, thank you very much! 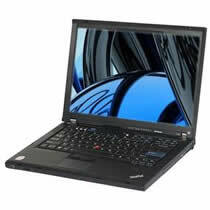 I have the same X220 i5 motherboard it was working alright but I was hearing a noise from where the fun is and all of a sadden it went off, OI thought it was the battery. 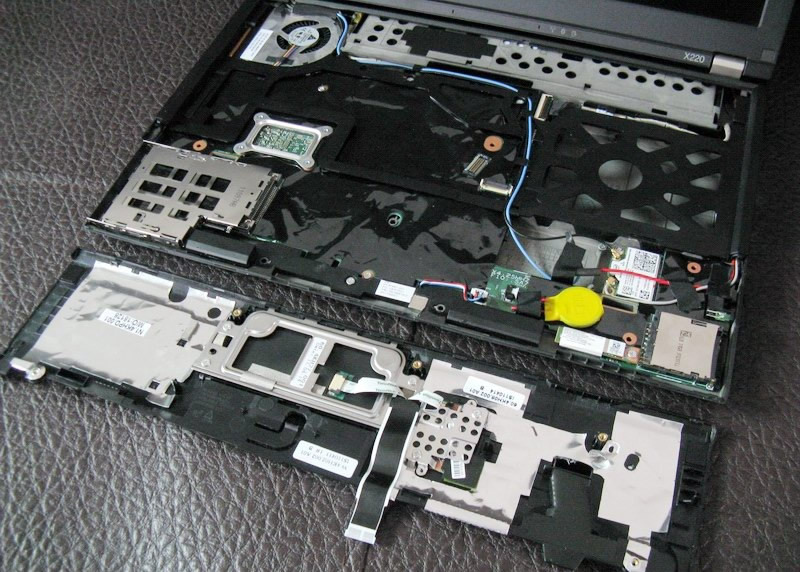 I connect the charger nothing shows I went in for different charger and the same battery but still nothing shows up I disassemble the Laptop I connect the motherboard with only the charge yet still and is like there is power coming on the board at all and am very sure the adapter am using is working perfectly. 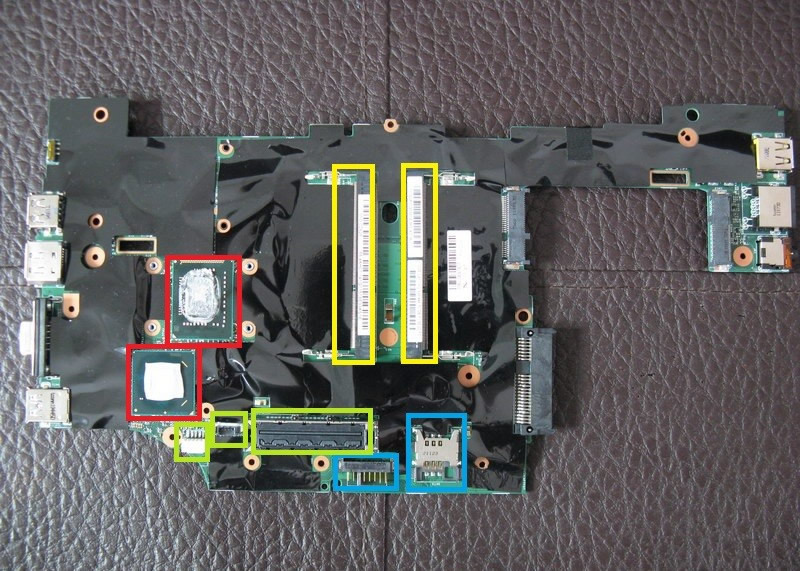 Any idea how to troubleshoot the Lenovo x220 i5 motherboard. There is no power coming on the board at all. 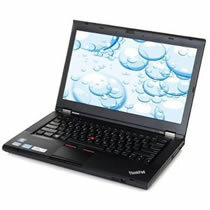 Good morning, I have a problem with my thinkpad x220. It turns off after a few minutes of use, then if i try turn on it again, it goes turn off after a few seconds. 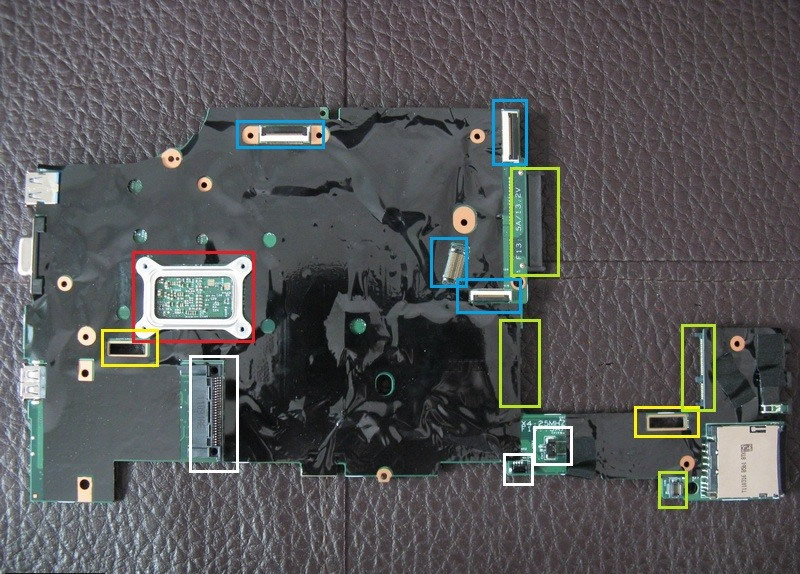 I have thought about a problem of the motherboard capacitors, but if I remove the keyboard, keeping it connected to the motherboard, the handset works with no problem. Do you have any idea of ​​the cause of the problem? The notebook works with no problem.